We are going through strange times. While the science, technology and rationalism has given us physical and intellectual tools to better the lot of humanity, we are witnessing the production of provocative material, literature and films in particular, which demonize the particular religion, Islam to be precise, and the prophet of Islam. On the other hand there is a section of community, feeling threatened and insecure coming to the streets to protest against such humiliation and insult of their religion. There are debates on freedom of expression, but how come the freedom of expression always goes to humiliate and demonize one particular religion only? Currently (September 2012), there are massive protests in different countries against the American embassies, resulting in death of four from the US staff, including Ambassador Chris Stevens, in Benghazi. Different countries are asking Google, the owner of YouTube, which is hosting this provocative and insulting video clip, ‘Innocence of Muslims’, to withdraw the film clip. At places the video clip has been withdrawn and blocked. US sticks to its ‘Freedom of Expression’ stance and the many protesters are still on the streets. The film clip, of around 14 minutes duration is part of the full length feature film made by Nakoula Basseley, a US based Christian. The film is very insulting to Islam. In this film large number of modern day mob of bearded Muslims is shown to be attacking Christians. It also takes the audience back in time to show a distorted life of Prophet Mohammad with negative and aggressive traits of personality. It is crude film, made in extremely poor taste and has generated strong reaction amongst large section of Muslims. It must be pointed out that this is not the only type of reaction to this film. 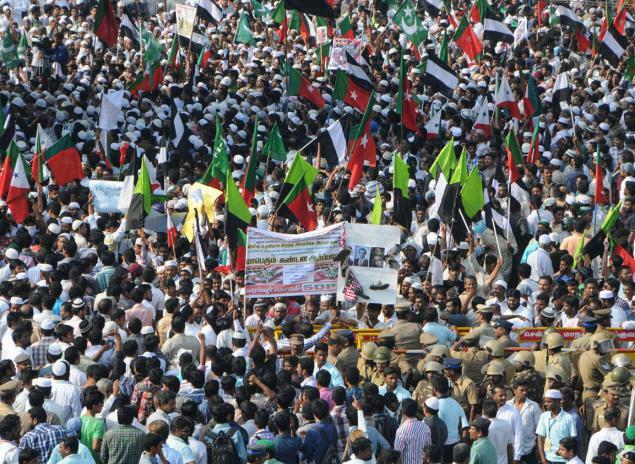 There are sections of clerics who have asked the Muslims to keep restrain. Quoting the moral precepts from Islam, Quran, they said that Islam is a religion of peace and no violent protests should be held. The best response to this despicable film has been from a section of Muslims distributing the book on life of Prophet Mohammad, the prophet of peace. During last several years, it has become a sort of standard pattern by many in the West and some here in India to demonize Islam. We remember the Danish cartoon of Prophet, where he is shown as a terrorist, with a bomb tucked in his turban. A Florida Pastor went on to burn this holy book, Koran, saying that Koran teaches violence. Some US soldiers in Afghanistan also burnt copies of Koran, on the ground that the terrorist elements had written messages on those copies. Muslims in Chennai protest against the film "Innocence of Muslims"
The demonization of Islam and Muslims has a pattern and agenda. The cartons and films are the outcome of the deeper political processes, which aim to control the oil wells in West Asia. The imperialist greed of United States marshaled the flag of “Islam the New threat” since Ayatollah Khomeini came to power in Iran, overthrowing the US stooge Raza Shah Pahlavi. Later the slogan was worsened with US setting up Madrassas in Pakistan to train Al Qaeda-Taliban to initiate the Muslim youth to fight against the occupying Russian armies in Afghanistan. The word, Jihad and kafir were distorted to indoctrinate the Muslim youth in these Madrassas. With later trajectories and the event of 9/11, World Trade Center attack, the US media with all its guile, popularized the phrase ‘Islamic Terrorism’. The phrase was picked up by the media all over the World and later became part of the social common sense. This is a major abuse of religion for political goals by the imperialist power. One can understand this demonization of Islam as a part of US policy, a cover to hide its agenda to control the oil. To understand it in the way Noam Chomsky ‘coined the phrase’ Manufacturing Consent’, the coining of the word Islamic terrorism is part of the US mechanism of manufacturing consent of the world to give assent to the US attacks on Afghanistan and Iraq. This US policy gas given rise to twin processes. On one hand the phenomenon like a Florida Pastor Terry Jones burning Koran or the Danish cartoonist drawing Prophet Mohammad as terrorist or the present film has been the outcome of the intense propaganda against Islam. This US propaganda has been backed up by the US sponsored ideology of ‘Clash of Civilizations’, according to which the current era of World History is the era of assault of backward Islamic civilization on the advanced Western civilization. This distorted perception, this ideology was used as a cover for US agenda in West Asia. The other process which got unleashed was that the psyche of global Muslim community started being affected. The perception came up that Muslims (Afghanistan and Iraq) are being attacked, they are under threat. In India the added aspect was the rise of RSS type politics, bringing up Ram Temple issue and starting hatred for Muslims. A large section of Muslims started feeling intimidated and besieged. It became easy for mobilizing them around identity issues. Any community which feels besieged, section of it becomes vulnerable to easy provocation and identity based mobilization. It is a vicious circle, the Islamophobia on one side and besieged community on the other. In this scenario the Muslim clerics who are asking for peace are the beacon lights of hope for the community. The Muslims who are distributing the books on life of prophet need to be complimented. This is what the sane response from the community has to be. What about US, imperialist designs and its mighty propaganda machinery doing all the mischief in the world? Can there be a process of controlling that? Under Kofi Annan, when he was Secretary General of United Nations, a high level committee produced a report, ‘Alliance of Civilizations’. This report got lost under the barrage of Islamphobia. It is time the world as such takes note of the deeper humane values which have developed by humanity over a period of time, the values which have led to the reports of type of ‘Alliance of civilizations’, the UN conventions which have conceptualized the Human rights for all. The trigger which has incited the demonization process of religion and films like this one are provoking these insane reactions from a section of Muslims. Can United Nations be revived as a global platform for monitoring the norms for Nations, media and other aspects of our global life evolved to ensure that democratization and human dignity is promoted. Can the World come forward to check the aggressions of ‘The Super Power’? That’s when such films will cease to act as factors promoting violent reactions. And even such crude attempts at insulting others’ religion will come down. May be with such norms and restraints on US policies we can hope that such incidents will come down. Even if there are elements making some films like this there will be others making a film giving their own versions of Prophet’s Mission of peace in the World. And finally we also need to preserve the concept of freedom of expression moderated with its limits. We also need to cultivate methods of protest where hysterical emotions are kept at bay and rational approach is brought to the fore. Anybody should have the right to criticize religious doctrines and symbols. Why should religion be beyond criticism? If a film or cartoon's representation of a religion is incorrect, the response should not be violence and suicide bombing. Why do the religious people should insist that everyone should respect their beliefs - even those beliefs and customs which are nothing but nonsense? If followers of Islams do not like their prophet to be represented in films, cartoons, and caricatures, let them don't do it. But why should they prohibit (and that too using violent methods) others from doing so? After all, Muhammed is a public figure. Not only Islam and their prophet are criticized, but Christianity, Judaism, Jesus Christ, etc have also been lampooned by western critics. Only, the response to these lampooning has been more civilized. From when have the rationalists become apologists for Islamic fundamentalists? "What exactly was in the film? Who made it? What were their motives? Was Muhammad really depicted? Was that a Qur’an burning, or some other book? Questions of this kind are obscene. Here is where the line must be drawn and defended without apology: We are free to burn the Qur’an or any other book, and to criticize Muhammad or any other human being. Let no one forget it." "The freedom to think out loud on certain topics, without fear of being hounded into hiding or killed, has already been lost. And the only forces on earth that can recover it are strong, secular governments that will face down charges of blasphemy with scorn. No apologies necessary."